The room falls silent as the third broker produces an absent colleague’s card. Remember this scene, where the tension is palpable as the 80’s stockbrokers each flip out their business cards, competitively sizing up each other’s typeface and stock choices? In this digital age, the humble business card can make an even more dramatic impact as your tactile calling card. 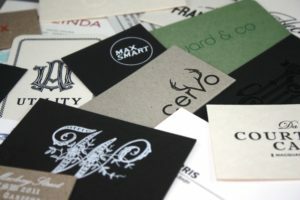 Cards are still the most effective way for businesses to present their uniqueness or an individual to make an impression, when passing over your details as you network. Of course, clients will Google you but a business card is a compact little advert for what you or your business stand for. Another bland, flimsy card will not make the cut. Push the envelope with different substrates (plastic, beermat board) or make an impression with a foil stamped letterpress printed or embossed business card. These days, business people (especially in the creative fields) don’t even settle for one card but have a series of different themes. Our technology has made business cards more interesting because we are capable of achieving beautiful embellishments. Try a clean crisp emboss or luxe letterpress for understated elegance. Or go all out with some foil-stamped bling! Now, we’re not suggesting you to get all Patrick Bateman on us, but you don’t want to be left behind in the business card stakes. Why not ask us to help you inspire a little bit of business card envy of your own?